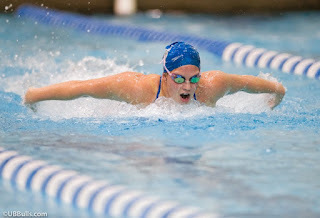 BUFFALO, N.Y. -- Coming off of a second place finish at the Magnus Cup Invitational, the University at Buffalo women's swimming & diving team will once again head to Akron, Ohio on Friday as they set their sights on the Zippy Invitational hosted by the University of Akron in the Ocasek Natatorium. The competition, which is set to span over three days, will welcome 10 teams including Akron, Bloomsburg, Bowling Green, Clarion, Marshall, Niagara, Oakland, St. Bonaventure and Toledo. The invitational kicks off on Friday, November 30, at 9 a.m. for preliminaries, followed by diving prelims at 1 p.m. and finals at 6:00 p.m. The format on Saturday will mirror Fridays, but on Sunday, the final day of competition, prelims will begin at 9 a.m. with the final rounds commencing at 4 p.m.
Buffalo had a strong showing at last year's invitational, claiming second place with 1,534.5 team points, just behind the host Akron. The Zips have claimed victory in each of the past four-consecutive invitational events. Earlier this month, the Bulls were able to claim second place in a deep field of teams at the Magnus Cup invitational. Leading the way for the Bulls on the weekend was Junior Katelyn Burns, as she continued her dominance in freestyle events, swimming to victory in the 200 yard freestyle with a time of 1:49.11, a career-best. Burns was also the first place finisher in the 100 yard freestyle event, swimming to victory for Buffalo in a time of 49.88, another career-best for the junior. In the diving well, Jae Sarkis broke a pool record in the 3-meter dive event, showcasing her skills to a score of 316.70, over 38 points ahead of the next scored diver in her heat. Looking ahead, the Bulls will return home for their next competition as they host the UB Diving invite on January 11-13.